Food , Health April 12, 2016 cpgmgr 2 comments. Laura Theodore’s Vegan-Ease: An Easy Guide to Enjoying a Plant-Based Diet, offers more than 130 delicious, vegan recipes that are quick and easy to prepare, each complete with nutritional analysis. Enhanced by over 200, full-color photographs, each recipe is ranked with an Ease-Factor to make it easy to choose recipes that fit into any busy schedule. If you are looking for an easy and fabulous warm-weather salad, this tasty recipe makes a lovely addition to any festive springtime meal. 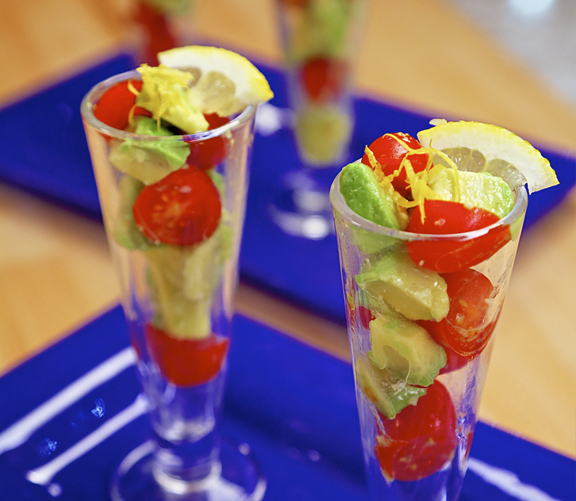 Spooned into tiny parfait or champagne glasses, this colorful combo provides a refreshing change to a green salad. 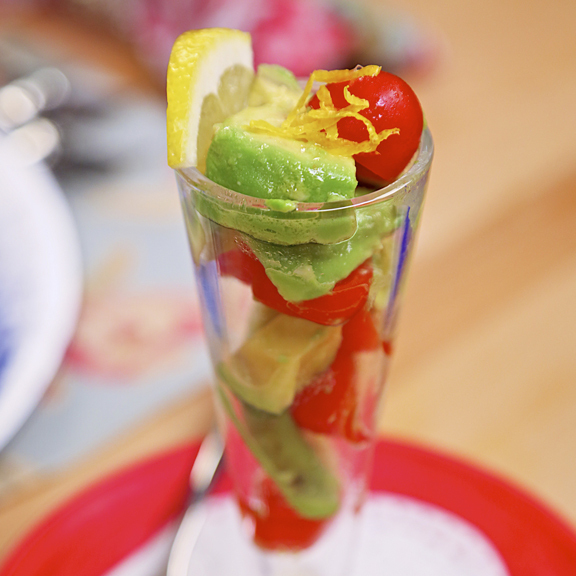 With a pretty presentation, and delicious flavors, Avocado Salad Parfaits are sure to please all the diners at your table throughout the spring and summer months! Put all of the ingredients in a small bowl and gently stir to combine. Season with more salt, if desired. Cover and refrigerate for 30 to 60 minutes before serving. To serve as a fancy first course, spoon in to pretty glasses, displayed on a decorative salad plate. This warm-weather salad is easy and fabulous! Laura Theodore is an award-winning public television personality and host of the Jazzy Vegetarian, presently available in 88% of US households. She is a vegan chef, radio host, jazz singer, and the author of Jazzy Vegetarian Classics 9781937856939 and Jazzy Vegetarian 9781570672613. In 2014, Laura was honored with a “Special Achievement Taste-Award” along with the likes of Martha Stewart and Emeril; she has also been recognized by VegNews magazine with a “Totally Tubular Veggie Award.” Laura hosts the popular podcast radio show, Jazzy Vegetarian Radio, now in its 7th year, and has appeared on every major TV network. She writes a weekly food column for Mother Earth Living and has been featured in many highly respected news, food and lifestyle-related journals. A critically acclaimed jazz singer and songwriter her CD, Tonight’s the Night, received a “Musician Magazine Award.” Laura has appeared in many plays and musicals, including the Off Broadway hit show Beehive, earning her a coveted “Backstage Bistro Award” and was honored with the Denver Critics Drama Circle Award as “Best Actress in a Musical” for her starring role as Janis Joplin in the world premiere production of Love, Janis. Love "The Jazzy Vegetarian" on Create TV. Miss seeing the show. When is it returning?